As South Africans it troubles us that there are some inequalities in our society that it will take decades to correct. Many wish that there was some way they could help to make the lives of children better. However, they are often not close enough to the community to make a real difference and are never sure if their donations actually produce results. 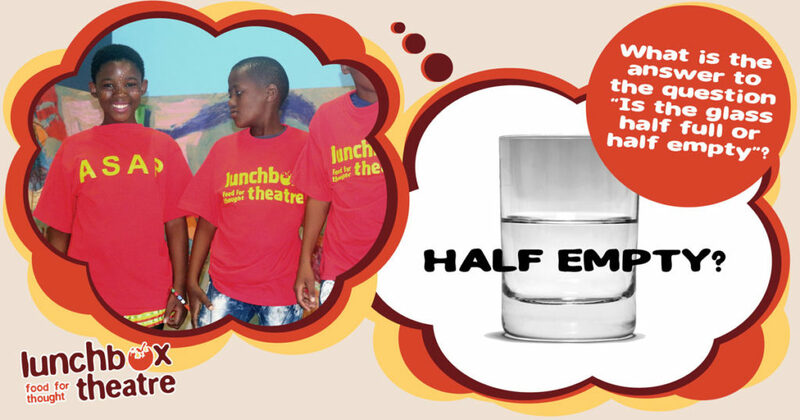 Lunchbox Theatre is right there in the community with the children filling the ‘glass’ with the opportunities that will change our country. We know what the youngsters need and we make every cent count. We don’t need to tell you about the huge difference after school classes in art, drama and dance give to our youth in disadvantaged communities. In a nutshell, these very valuable extra lessons give each child a taste for success that inspires them towards making the most of their lives. Through the Rolf-Stephan Nussbaum Foundation and our 7 Facilitators, we are empowering around 85 children and giving them a thirst for more knowledge. Once you have read this article, please take a moment to look at the delightful of photos on ShowmePlett and you will experience the joy and delight on the children’s faces during the recent ASAP Showcase in November 2018. The kids put their absolute best into preparing for the showcase and are super motivated. They are the lucky ones. There are many other children who long to have the same opportunity. This will turn their childhoods into a magical experience. Please find it within your heart to donate R100 a month to so that one more child can benefit by ASAP classes and we can keep on “filling the glass” on your behalf. It’s very easy – all you need to do is click on ASAP Upliftment. Do it now and then you can feel good that it is all been taken care of by our accomplished team of Facilitators. This entry was posted in Children and tagged act, acting, AIDS, children, citizenship, comedy, concert enactment, confidence, dance, dogs, Donations, donors, drama, eastern cape, ecology, education, elephants, environment, families, garden route, government, health, HIV, kids, Live theatre, marine protected areas, nature, ocean, performance, performing, play, public spirit, puppets, schools, show, skills, social, social conscience, south Africa, sponsors, stage show, teachers, teenagers, trees, Waste, water, whales, youth. Lunchbox Theatre are fascinated by Trees and may have uncovered new evidence that they are amazing intelligent, selflessness and co-operative beings.